It went from sheer pandemonium to quiet in 30 seconds. 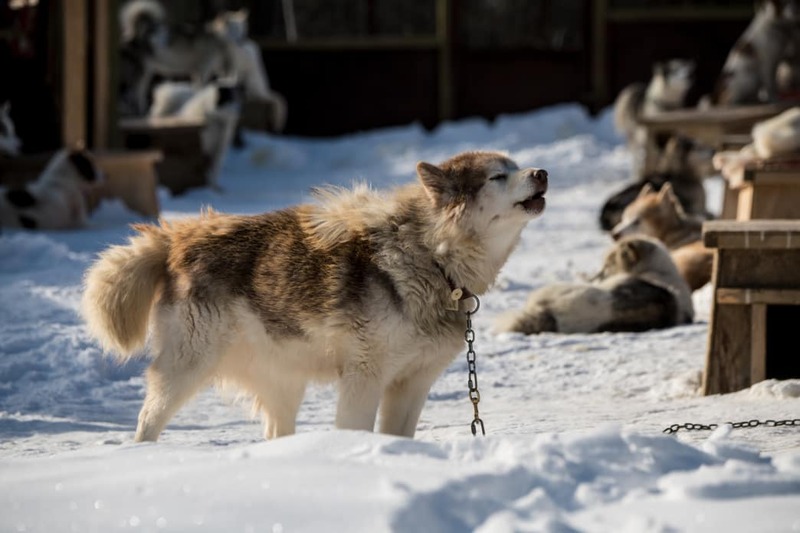 One minute, more than four dozen Alaskan Siberian dogs were barking, thrashing at their harnesses, jumping, whining, chewing their leads—pure canine chaos. Of the barking horde, we clipped four dogs to the sled and got inside. Then, our instructor released the leads holding the sled in place on metal poles and we rocketed into the woods. It was almost silent, except for the sound of the dogs panting and kicking up snow. I was astonished at their beauty, how they transformed into a formidable force of paw-powered speed—a feeling I’d experienced over and over for the next two days. I’d heard about dog sledding here and there over the years, especially around the time of the Iditarod, the notoriously grueling, 938-mile race that takes place in Alaska at the beginning of March, or in adventurous tales of Arctic and Antarctic explorers. 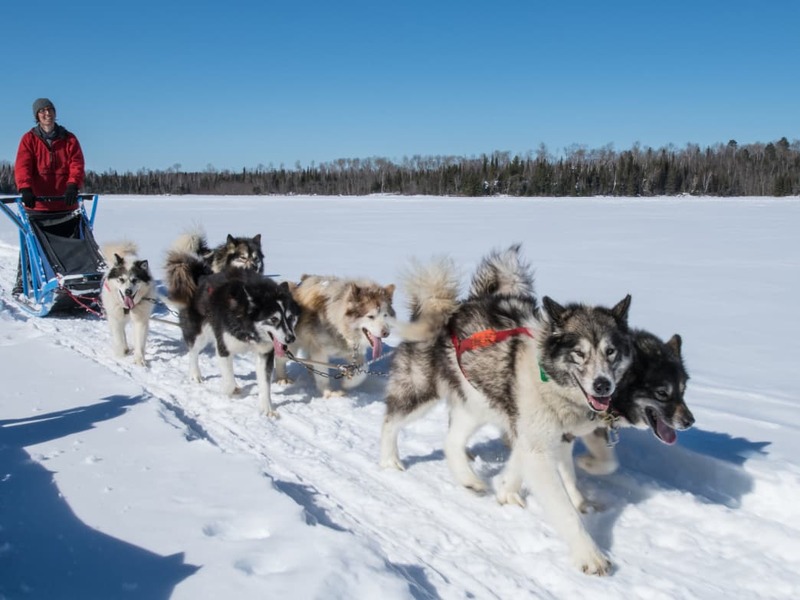 But I never dreamed about taking the reins myself, until a coworker told me about an all-women’s dog sledding retreat outside of Duluth, Minnesota. Both animal lovers, we decided to give it a go. It was housed in a 400-acre Finnish homestead in the Superior National Forest, run for about 30 years by Kathleen Anderson. Over the weekend, we’d learn how to run the dogs on the sled, which included harnessing, directing, and, of course, taking care of the dogs. In late January, we drove eight hours overnight to Minnesota from Chicago. We finally pulled into a long snow-covered driveway, passing 30 energetic dogs on the way, each with its own dog house inscribed with their name. Also in the driveway was a truck carrying 16 dogs, which we later learned were owned by a visiting musher, Cindy Gallea, who had run the Iditarod 14 times. Anderson led the instruction with excellent help from her assistants and Gallea. For the next 48 hours, our group of nine bunked up in a cabin built by Anderson, which became our cozy, off-the-grid home base, surrounded by evergreens and snow. We’d pump water from a nearby well, keep warm from a fire-burning stove, and use headlamps at night to light our way outside, all with very little connection with the outside world. I was nervous and excited at our living arrangements. It would be my first time truly off the grid, and I wanted to see how I’d hold up. I also couldn’t wait to learn about dog sledding. I wouldn’t have much use for it in Chicago, of course, but I knew it would be an experience I’d remember forever, and at the very least, I’d have some first-person insight the next time I heard about the Iditarod. Before we learned how to run the dogs, we had to learn the critical step of harnessing them and getting them ready to hook up to the sled. It was the first thing we learned when we arrived, after lunch. Harnesses are sized for each dog, and fitting them means gently lifting the dog’s legs into the harness. Some dogs took to it easily, while others squirmed and resisted. Once each dog was harnessed, we had to wait until Anderson signaled that she was ready for us to hook the dog to the sled. Then we hopped the dog over on their hind legs, front feet in the air, to avoid stepping on the dog’s feet. It took about 15-20 minutes to harness a new set of dogs. Once at the sled, we hooked them up to the lead of the sled according to their role on the team. The lead dogs took the front; the dogs closest to the sled were called the wheel dogs. 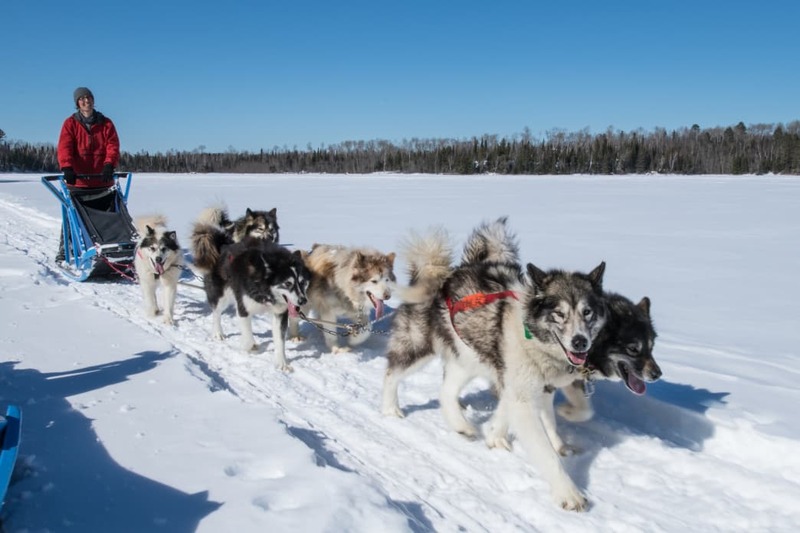 For sleds with more than four dogs, the dogs in between are known as point dogs. The lead dogs direct the sleds, keeping the pack and sled on the path, while also setting the pace. It’s critical that lead dogs are alert and responsive to commands. Wheel dogs tend to be the larger dogs who can more directly pull the weight of the sled. Point dogs, meanwhile, help steer the sled and keep it on course. Once we hooked the dogs up to the sled, we still had to keep a sharp eye on them, since some dogs will chew through their leads if they are idle and unattended for too long, which happened several times through the weekend. Once the dogs harnessed to the sled, we needed to climb into the sled. The sled is connected to poles in the yard to stabilize the sled so the dogs don’t take off running. 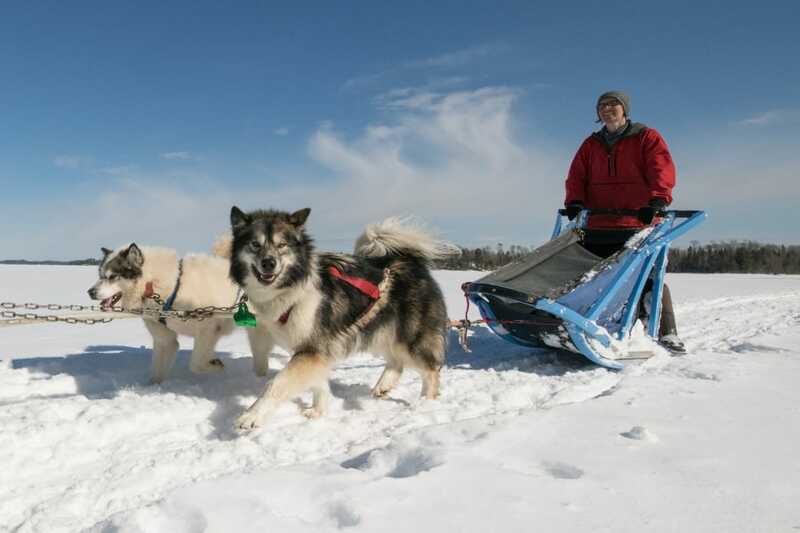 When the riders—typically the driver and a passenger—and sled are ready, the leads are released, and the dogs are off. We never went out without a veteran musher with us, either in the sled or directing the sled. And before taking off, our instructors instilled a critical lesson into our heads: We had to hang on for dear life, and not to let go for any reason. If we were to fall, the dogs could run off and potentially hurt themselves or others, damage the sled, or worse. Each sled had two types of brakes: one on the sled itself that the driver stands on with all their weight, and a metal claw that anchors into the snow and ice if the driver needs to get off the sled or stay mobile for a few minutes. Our sleds usually had no more than four dogs since that was about as much we could control, but Iditarod teams have up to 16. Our runs were short—usually no more than 10 minutes, for just a few miles, tops. We probably didn’t get any faster 7 or 8 miles per hour. Even so, the short rides gave me a thrill; seeing these animals transform into locomotion powerhouses pulling us across the snowy landscape was unforgettable. While the dogs knew the path, it was still critical to guide them using the proper calls: “Gee” for right and “Haw” for left. It was immediately clear that you had to use a loud, confident voice; otherwise, the dogs might ignore you. On my last run, there was a fork in the road; we needed go left. However, I didn’t yell “Haw” in time so the dogs started taking the other path. I had to step on the sled break hard and throw the metal claw into the snow to stop the dogs. It was terrifying standing on the brake, feeling the strength of the dogs tugging at the sled. A few times, they even managed to move the sled a few inches, despite my entire body weight on the brake. Their power was humbling. My instructor eventually got out of the sled and pulled it back to the left, and we were on our way again. But the work wasn’t over once we returned to the yard. We had to detach all the dogs, panting and covered in sweat, hop them back to their doghouses, and take off the harness. Every run required a new batch of four dogs. We ended up taking four rides over the two-day weekend, going out twice as passengers and twice as drivers. While it was glorious to be a passenger, I definitely preferred driving the team. I loved the feeling of the frigid wind through my hair and the tangible sense of connection with the world, the dogs in front of me, the quiet, snowy forest all around me. I also relished the giddy rush of being in control (even if the dogs knew more about what was going on than me! ), and the exhilaration of being around the dogs kept me feel warm and energetic. But by the end of the working day, exhaustion would set in, and we slept soundly until early morning—when it was time to do it all over again. Running the dogs is the fun part: Most of the work is done behind the scenes caring for them. We spent hours raking hay into their dog houses to keep them warm and scooping their waste with a shovel, which was especially challenging given the snow and ice. We also learned about the incredible effort involved in feeding and watering the dogs. Twice a day, we chopped up meat and served it with kibble to the dogs. In the dark, this task required a headlamp and some careful footing in the ice and snow. We also put raw meat in their water for extra calories and hydration. But one of the most magical parts of the weekend was how the dogs responded to that care. Approximately 20 minutes after dinner, they all howled, seemingly in a symphony of appreciation for the food—every single time. I heard their howls other times, too. Sometimes in the early morning, when I’d wake up from the cold after the woodfire stove went out, I’d hear the dogs howling in the dark. Perhaps they were howling in response to other dogs or even wolves in the distance. Or maybe they were just happy it another day had arrived, with its promise of rides. Whatever the case, it was a sound I loved. I could relate. Over the weekend, as we got to know the dogs, we could see how much running was in their blood. There was Tillie, who loves getting her belly rubbed, and Amaraq, whose bark was one of the loudest in the excitement prior to a ride. I saw a new side of myself, too: my ability to adapt to new, and challenging, circumstances. I realized I could handle living off the grid without running water or an inside toilet, even for just a weekend. And I discovered a newfound appreciation for the great outdoors—even during the frigid Minnesota winter!—and the beauty of traveling over its frozen landscapes with powerful creatures. On our way home, I found some seeds in my boots, hidden perhaps by some squirrel or chipmunk as an unintended souvenir. But most importantly, I grew to appreciate the remarkable gift from those huskies, to give themselves entirely to us, allowing themselves to be harnessed for their might and energy. It was the most powerful lesson of all: a reminder that we are of nature, not separate from it. Written by Elisa Shoenberger for RootsRated Media in partnership with RootsRated.